There can be a lot to consider when you are in the market for a new bike, and it can get a little overwhelming if you don’t first prepare yourself. This guide is intended to provide some assistance in preparing to shop for your next bike. Bikes are made to handle all sorts of terrain and cater to different styles of riding. You will want to determine the type of bike riding you plan to do, which will dictate the model of bike that will best suit you. Some bikes can handle multiple types of terrain, while others are designed for very specific styles of riding. The most common type of bike would be considered a touring or commuter bike, which comes in a wide variety of makes and models. Depending on whether you actually utilise your bike to travel to and from work, or you are looking for something to enjoy leisurely pedals along bike paths, there are a few things you may want to consider. The type of handle bar and where the controls for gears and brakes are located, the size and type of tire, and the overall comfort of the seat and frame. If you want to ride on back country trails you would want a mountain bike, which can also be ridden on streets or paved pathways. Depending on the difficulty of the trails you intend to ride you will want to consider aspects of the bike such as tire type, suspension, and weight of the frame. Mountain bikes are basically the only models that are designed to handle off-road terrain, and can be the most versatile option but may not be the swiftest way to get around city streets. If you are looking to ride long distances or participate in bike races or triathlon, you will want a road bike that is designed for speed and covering a lot of mileage. Road bikes typically have curved handle bars with the brakes and gears, thinner tires, and lightweight frames. Road bikes can be sensitive to terrain type, and typically require well-managed road or path in order to ride well and avoid damage. Other types of bikes include BMX models which are designed for bike parks and performing street or park tricks. There are also folding bikes which are popular when trying to conserve space or travelling with a bike. Fixed gear bikes or “fixies” are common in cities or for people who are looking to get a workout while riding their bike. 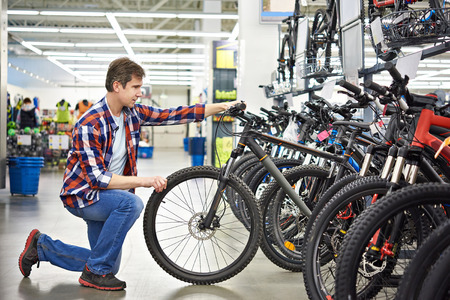 The range of prices for bikes can be quite significant, and your budget will dictate the quality of the bike itself as well as the additional features such as the tires, shocks, or gears. There are many reasons to consider saving for and spending the money for a higher quality bike, which is likely to last longer and provide a safer option than cheaper and lower quality bikes. Typically, more expensive bikes are made of higher quality materials, lighter weight, better performing, and more durable than cheaper models. If you have a lower budget than the quality of bike your intentions demand, it is possible to consider second hand bikes or attending a bike auction. Those bikes that are more expensive when purchased brand new, are of high enough quality that they are perfectly viable when being re-sold. Once you have determined the type of bike you want to purchase, and done some research on the existing range of makes and models, you will need to find an appropriate outlet to purchase exactly what you are looking for. If you do intend to buy a well-made, more expensive bike, it is best to consider the options for local bike shops in your area. When utilising a local bike shop, you are not only supporting small business in your area, but you are developing a relationship with the place you will likely want to bring your bike for upkeep and to upgrade or replace parts. In general, it is best to avoid purchasing a bike you intend to use for any serious length of time from a general store or department store. Once you have determined the bike you want and the outlet from which you intend to purchase it, you will want to test out a few models to ensure you are getting a bike that is the right size, weight, and design for you. When testing a bike out you will want to consider the relative size in comparison to your body type, the ergonomic design and overall comfort of the ride, as well as the mechanical systems such as the brakes and gears. After doing your research and testing out a few models, you can be confident in the decision you make on what bike will be best for you.